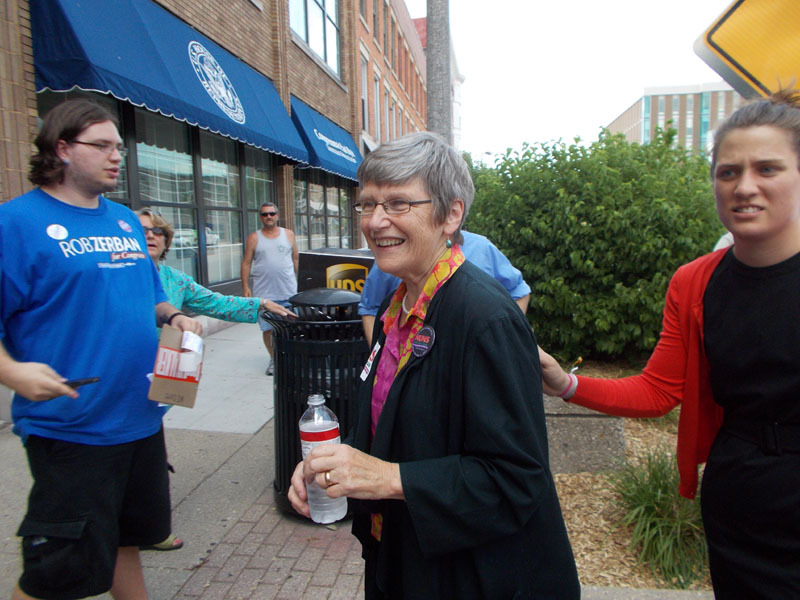 Sr Simone Campbell of NETWORK Lobby, head “nun on the bus” (center), with Casey Schoeneberger of Faith in Public Life (right), who is managing media relations for the bus tour. After going to see the Nuns on the Bus in Janesville, WI, I found on facebook a video the Sinsinawa Dominican Sisters had recorded of Sr Simone Campbell earlier the same day, in which Sr Simone described candidly that “we asked for help in DC, and our colleagues, all the big players, they came together and helped us brainstorm this.” Certainly made me wonder who were “the big players” in DC that helped make this happen. Well, we can now verify one of them: Faith in Public Life, the George Soros-funded, Center for American Progress-associated political progressive organization that is also engaging in a media campaign against the Fortnight for Freedom, as shown in this recent Advisory Memo to Journalists from the USCCB. Among other efforts, they put out talking points to try to get journalists to politicize the Fortnight for Freedom and trip up bishops — see also Fr Z’s coverage and commentary of the Advisory Memo. Well, no wonder the Nuns on the Bus so entirely wanted to evade and hide the religious freedom message we brought to them in Janesville. No wonder all Sr Simone had to say about it, while walking right next to FIPL staffer Casey Schoeneberger, was “it’s complicated”! “The sisters are merely raising concerns about Paul Ryan’s budget and saying that a budget that decimates services for the poor does not follow their religious values,” said tour spokeswoman Casey Schoeneberger. 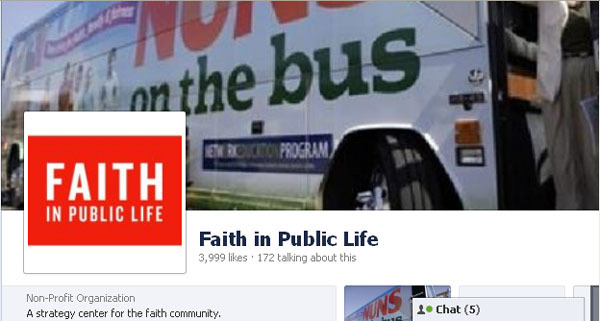 If you visit the facebook page for FIPL, Nuns on the Bus is actually their “cover image” (their main image on the page, with which they represent themselves) and they are steadily sending messages about the NETWORK bus tour on facebook and on their website. The bus tour has now just ended, but I think one thing it’s helped make it very crystal-clear is why the Congregation for the Doctrine of the Faith was right to specifically suggest that women religious leaders should not be involved with NETWORK Lobby. This is pure progressive politics, in coalition with other progressive “big players”, without any distinction made (indeed a refusal to make a distinction) between NETWORK Lobby’s perspective and the stridently pro-abortion politics of secular progressivism. The first leader of Faith in Public Life, Rev. 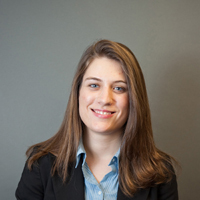 Meg A. Riley, describes some of her previous qualifications, and the group’s founding. While Unitarian Universalism is my home base, I have spent the past eighteen years building relationships with national leaders across the faith spectrum. 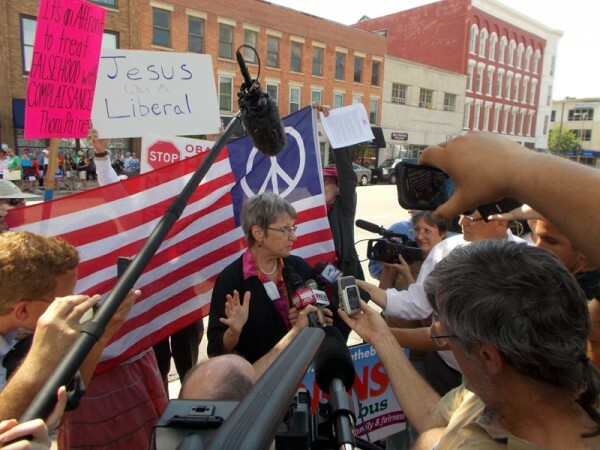 I have served on national boards including The Interfaith Alliance, Americans United for Separation of State, the Religious Coalition for Reproductive Choice, and Interfaith Worker Justice. This means that I have relationships across a spectrum of faith. I have been part of founding two nonprofits for interfaith work: In 1997, anticipating the Million Man March of the Promise Keepers, I worked with others to launch Equal Partners in Faith, which worked to link racism and homophobia and to challenge the Promise Keepers’ premise of being nonsectarian. Before the UUA even had a Public Witness team, I appeared on dozens of national TV shows. Following the 2004 elections, I gathered with other people of faith at the invitation of John Podesta from Center for American Progress, to reflect about what we might do. I emerged from that meeting as the leader of a group empowered to start another nonprofit, which has become Faith in Public Life (FPL). See www.FaithinPublicLife.org. Next year I will complete two terms as founding board chair of that group. FPL is amazingly effective, well-connected, and creative. Founded on the principle of open source support for religious groups on the ground rather than institutional self-promotion, we have quickly become a go-to group for progressive religious initiatives. FPL’s sister organization is Faithful America, which is also affiliated with True Majority and Res Publica. While FPL has hundreds of affiliates throughout the United States, its primary partners are Sojourners, Interfaith Worker Justice, Vote the Common Good, the Jewish Council for Public Affairs, the Muslim Public Affairs Council, the Episcopal Public Policy Network, and the National Council of Churches. FPL also has a close relationship with John Podesta‘s Center for American Progress (CAP). Two of CAP’s senior fellows, Fred Rotondaro and Rev. Susan Brooks Thistlethwaite, currently serve on FPL’s board. Another FPL board member, Tom Chabolla, is the assistant to the president at the Service Employees International Union, and he previously served as associate director of programs for the Catholic Campaign for Human Development. Other noteworthy groups affiliated with FPL include People Improving Communities through Organizing (PICO), ACORN, the Children’s Defense Fund, the Interfaith Alliance, People for the American Way, the Center for American Values and Public Life, and Pax Christi USA. On June 27th, Sr Simone was interviewed by a reporter for Bill Moyers’ PBS show. Her reponse to “Tell us about your own personal journey. Who are your greatest influences?” does not mention Jesus, or any Catholic leader. Her response to “What does being Catholic mean to you?” has only vaguely to do with Catholicism, but entails a rejection of the miracle of the loaves and fishes, in favor of a materialist interpretation of the story that George Soros would find entirely satisfying. Fredericks: What does being Catholic mean to you? Sister Simone: To me it’s that amazing history of spiritual practice, social engagement, witnessing to the fact that Jesus lives in our world now and says that there is enough if we share. The miracle of the loaves and fishes — one of the accounts says 5,000 men ate. Well, the reason they only counted the men was the women and children knew it was the women who had brought all the food! Only the guys thought it was a miracle, the women knew it was about breaking bread and sharing it. This isn’t biblical — this is just my interpretation of it, but to me the miracle was sharing. Yikes. She’s right that isn’t Biblical. Neither is it Catholic. As Steve Ray points out in his Catholic response to this fashionable error, “the entire patrimony of the Catholic Church upholds without any deviation whatsoever that our Lord actually did multiply loaves and fishes by divine power to feed the multitudes.” But oddly enough… one thing I get out of Sr Simone’s re-conception of it is that subsidiarity works. Thanks for this post and for the link to Sr. MaryAnn Walsh’s USCCB story. Very informative! Yes, maybe we should all get on board with the Republicans and their abortion profiteer candidate Mitt Romney. Harold, Mother Jones would probably like to convince pro-lifers that all candidates in some way have some sort of connection with abortion, therefore not to vote. It may be worth saying, because the media has oft portrayed both support for the Fortnight for Freedom and opposition to the Nuns on the Bus as partisan and Republican, actually the Nuns on the Bus came to my attention from the Catholic angle and not the political angle, I do not follow politics much at all and do not identify with any particular political party. In Casey’s and Sr. Simome’s regard, when are adulterous relationships and divorce settlements never ‘complicated’? We have to remember that the battle is not with human flesh, but with powers and principalities. True believers are not deceived by those who side with the culture of death or allow themselves to be bankrolled by them. I’m sure these nuns believe what they are doing is right, but they have been blinded by worldly delusions. Communista! Someone tell the “Nuns on the Run” tour that Communism doesn’t work, neither does Socialism and that if it isn’t Catholic Doctrine, then it is NOT Catholic. The only thing being thrown under the bus on this trip is Catholic Orthodoxy. She should be denouncing abortion, gay marriage and the HHS Mandate, not Paul Ryan’s budget. Thanks also for pointing out Comrade Casey to us. Now we know that whenever we see her then we can expect Red Herrings to be thrown at at us. Great work on the Soros connection. All these leftist groups are intertwined, and unless you know which one is allied with which, you can get thrown off. A group that does one thing can also share offices with, and a board with, a supposedly different group that is much more radical — but the radical positions and work don’t show up when you casually look into the other group. When the Catholic Religion crashes the Islamic will take over!! As a returning Catholic….a kid in the 60’s who was not catechised well then…I am now 60…. I have only come back because of solid teaching via EWTN TV & Immaculate Heart Radio. These have not just offered doctrine & dogma, but give solid historical analysis for those & every followed tradition in Roman Catholicism. So each time I hear or read stories of those Catholics who want to stray from Rome, I wonder why they continue to call themselves Roman Catholic. They should realize they are a modern version of what happened at the Reformation: they are Protestants. They should spend 35+ years in three variety of lacking teachings of Protestantism (30,000 + to date) as I did. Then perhaps they will yearn for the fullness of truth that can only be found in Rome. Catholic education is VERY important. It also really has to be faithfully Catholic–and unfortunately there have been serious problems with that, though my impression is that the situation is getting better. Without the sisters to keep the cost of Catholic education down it is difficult for the schools with their lay staff to survive. The Dominican Sisters of Mary, Mother of the Eucharist and the Nashville Dominicans are faithful teaching orders that are getting a lot of vocations and if they could spearhead a revival of teaching sisters that would be so wonderful. There are women from Madison Diocese who have joined these orders, and another one just went off to enter the Dominicans of Mary, Mother of the Eucharist. Oh, Elizabeth…send some out to California! Praise God for those lovely Sisters who adore Christ, and follow His Teachings and those of Rome. Regarding Catholic education, one problem is that too many schools don’t teach any substantive Catholic theology or catechism, and focus on very simple feel-good topics. At my parish school, there was a lot of teaching that the Church is people, not a building, and there were a lot of happy songs, but we learned very little about Catholic beliefs. (Luckily, my parents were able to fill the void in some areas.) My Benedictine high school, however, was much better and I benefited from a curriculum that included Bible study, Church history, and topics such as philosophical approaches to the existence of God. It’s hard to teach everything that Catholics need to know, but too many students graduate from Catholic schools with almost no knowledge of Church teachings.